This is a question that has been heatedly debated by religious fasionistas around the world. 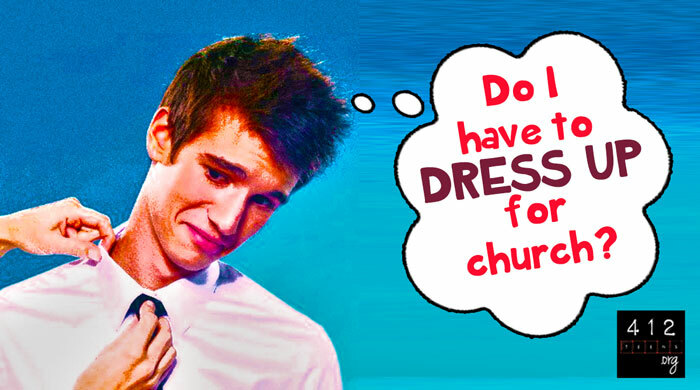 Maybe your church has a strict dress code, or maybe it's not really a question you've thought too much about. Either way, it's a well-known, traditional practice of many to dress in multi-layered suits and fancy dresses on Sunday mornings. But is there a Biblical reason people should burn themselves to crisps wearing suits and ties to church in the middle of a blazing hot summer day? In Genesis 35:1-3, Jacob tells his family to "get rid of the strange gods you have with you. Make yourselves pure, and change your clothes." But this change of clothes was more about a change in the heart that was reflected on the outside. Still, what does that mean for Christians today? Some people believe that if you're wearing jeans and a t-shirt to church, then you're being disrespectful to the Lord. They believe that you need to wear nice, possibly expensive, clothes that don't offend anyone else in the congregation. This viewpoint has several flaws. First, that's implying that certain clothes can actually match the grace of God. If no human can ever match the glory of God (Romans 3:23), then nothing humans create can either. Second, this opinion causes people to judge others on what they wear, which Jesus tells us is not cool in John 7:24. Third, just because a man wears a tank top and shorts to church, that doesn't mean he loves God any less than the guy in a pinstripe suit. Now that we've established that no clothes will ever be judged to be better than any others, you can see that to say one type of cloth is more "godly" than another is, to put it bluntly, stupid. Of course, that doesn't mean you should walk into church naked. It's a church, not a European beach. But you know what I mean. So, no. You don't have to dress up for church. You can if you want, but God doesn't require it. But if you dress up only to feel special, get attention, or to look more important than the more casually-dressed people, then you're really just showing off, and your clothes have nothing to do with your respect for God. Maybe just being clean and showered is a person's "best" because they can't afford fancy clothes. That's fine! For others, maybe they feel that wearing their best clothes is showing God how important He is to them. And that's fine too. In the end, we could all do well to take a "spiritual bath" before church by confessing our sin to God. That is how we make ourselves pure. It's your choice to dress up on Sunday mornings or not. Just remember, don't judge other people on their decision either way—dressing formally OR dressing casually. God is the ultimate judge of all, and when you arrive at those Pearly Gates, He's not going to look at your $80 khakis. He's going to look at your soul. No. You don't have to dress up for church. You can if you want, but God doesn't require it. Your clothes have nothing to do with your respect for God. However, if you dress up only to feel special, get attention, or look more important than everybody else, then you're really just showing off. Also, don't judge other people on their decision either way—dressing formally OR dressing casually. God is the only one who truly knows a person's heart, and He is the ultimate judge of all. 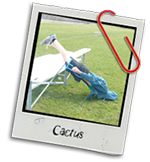 Cactus is a teen who, in his spare time, enjoys writing, listening to bands no one has ever heard of, and creating assorted wavelengths of random sound particles that ALMOST resemble real music. He is also fluent in the languages of English, sarcasm, and gibberish.